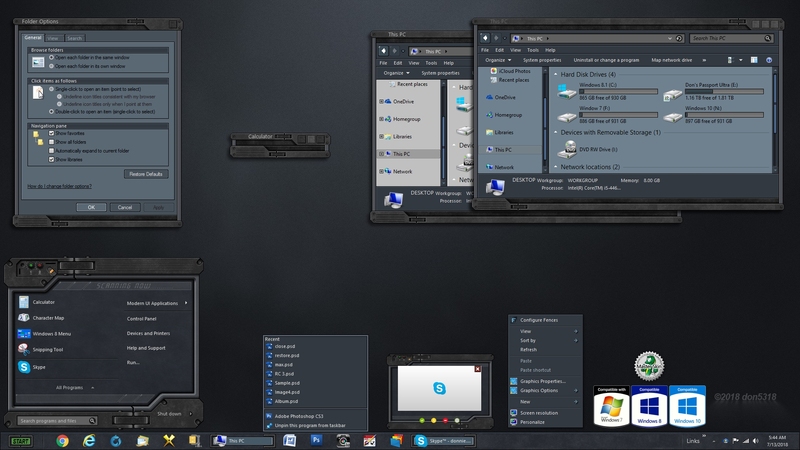 Another sci fi looking skin called Dark Tech, has sub styles for Win 7, Win 8.1, Win 10, and light/dark Explorer background. No roll up button, but can go into Windowblind and add the double click for roll up. if you choose to use it, enjoy Dark Tech. Why dark color theme? it is summer today .. nevertheless, it is a very very beautiful finish , cordially..
hi don.. Why dark color theme? it is summer today .. nevertheless, it is a very very beautiful finish , cordially.. Thanks Dave, Ross, and Jim. This looks good! The window sides are getting skinnier and I see some originality in your designs coming out. Excellent work Don, very beautiful skin! anywhere else to get wall paper the link is 404. I was getting the same thing here, it was working at the time I got the wall, but after I uploaded Dark Tech, for some reason it quit working; the site that is, so I have no clue, other than just find one that best matches the skins color online.